Recently I've really been enjoying getting back into beauty and makeup and trying out all the new products that are out there. I've treated myself to a few new products recently and also a couple that I haven't managed to get my hands on yet have caught my eye so I thought I'd do a little post, a good post to ease me back into beauty blogging I think. I need all the preparation I can get as I'm going to attempt to do Blogtober, blogging everyday during October! Firstly I think by now everyone must have seen the new makeup sponges that Real Techniques have recently brought out, as soon as I saw them I knew there was one set that I was definitely going to get my hands on. I've been using the miracle mini eraser sponges for a couple of weeks now and I'm so impressed, they've totally won me over when it comes to applying makeup with a sponge so now I'm using my other RT sponge for my foundation again. These mini sponges are £5.99 from Boots and you get 2 in a pack, they are said to have 6 uses but I like using them to blend in my concealer. It's the perfect size and shape to use to blend in concealer around any awkward places like under yours eyes or around your nose, I've found that my makeup looks a lot more natural now! 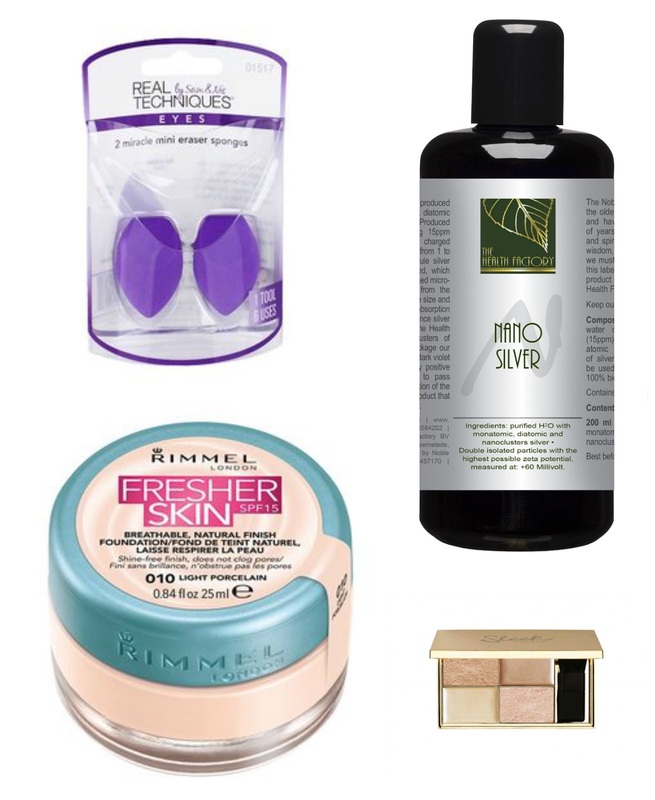 The other product from these 4 that I have tried out is the Rimmel Fresher Skin Foundation. I've only given it a go once so far but my first impressions were good. I got the lightest shade, Light Porcelain, which is a tad too dark for me but the light consistency of the product means I can blend it in really well and as long as I don't go too heavy I can get away with it. At first in the pot it feels like it's going to be a heavy product but once blended out it becomes a really light and breathable foundation, perfect for transitioning into Autumn. I just wish they could expand their shade range to suit more people like L'Oreal have! Next up is a product that I haven't tried yet but I cannot wait to give it a go when it comes through my letterbox. This brand is quite new and is certainly new to me but when I heard about the Nano Silver product I was interested to hear more. Noble Naturals is a new health and lifestyle brand that have a few different products but like I said it was the Nano Silver that caught my eye. It's a product that can be used to help fight a large variety of problems as it is one of the world's effective defences against bacteria and fungus. It can help treat bee stings and bug bites, nappy rash, burns, sores and cuts, toothache and various skin conditions. I've never come across a product that can be used to help soothe so many things, I cannot wait to try it as I think it will be the perfect product to keep in your medicine bag. After a little bit of research I found out that silver has been used for thousands of years as a powerful and natural antibiotic, it's not only been used on it's own but it has also been found to make other antibiotics more effective. It you are a fan of natural products then I think this is something you'll definitely want to look into, I'll be trying the product soon and giving you a full review! Until then you can find out more info at the Noble Naturals website. Finally the last product is one that I have yet to try but I'm definitely going to be adding it to my Boots basket very soon. I'm a big fan of my Sleek Solstice Highlighting Palette so when I saw that they were bringing out a new one, Cleopatra's Kiss, I knew that I had to try it out. The colours look gorgeous, ranging from shimmering golds to more delicate pinks, all with a stunning highlight running through them. Like Solstice the palette contains 2 power highlights and 2 cream highlights, a great balance and it has encouraged me to try cream highlights more. Plus I just cannot say no to the gorgeous shiny packaging, even if it is a pain to photograph! Look out for full reviews of some of these products soon and let me know what new products you've been trying recently!